In the Gospel the "priests went to Jesus to ask for his stamp of authority: ' By what authority are you doing these things?' We are the masters of the Temple'". "They did not understand the prophecies. They had forgotten the promise! They did not know how to read the signs of the time, they had neither piercing eyes, nor hearing for the Word of God: they only had authority ." Vatican City ( AsiaNews) - When prophecy is lacking in the Church, the People of God, the Word of God is lacking and its space is filled by an empty legalism and resulting clericalism. Because the prophet custodies the memory of the promise, looks at the present and points to the future path. Pope Francis spoke of the prophets in the Church, Vatican Radio reports, during Mass celebrated at Casa Santa Marta, stressing that the prophet "has within himself these three moments": "The past: the prophet is aware of the promise and has in his heart the promise of God, he lives , remembers and repeats it. Then he looks at the present, at his people and feels the power of the Spirit to say a word to help them to their feet to continue the journey towards the future. A prophet is a man of three times: the promise of the past, contemplation of the present; the courage to show the way towards the future. And the Lord always has guarded his people, the prophets , in difficult times, in times when the people were discouraged or destroyed , when the Temple was not there, when Jerusalem was under the power of the enemy, when the people wondered to themselves: ' But Lord you promised us this ! So what happens now? ' " . This is what happens "in Mary's heart when she was at the foot of the Cross". In these moments, "it the intervention of the prophet is necessary. And the prophet is not always welcome, many times he is rejected. Jesus says as much to the Pharisees that their fathers had killed the prophets, because they said unpleasant things: they told the truth, they remembered the promise ! And when prophecy is lacking the people of God something is missing: the life of the Lord is missing". "When there is no prophecy power becomes legality" legalism takes over. Thus, in the Gospel "the priests went to Jesus to ask for his stamp of authority: ' By what authority are you doing these things?' We are the masters of the Temple'". "They did not understand the prophecies. They had forgotten the promise! They did not know how to read the signs of the time, they had neither piercing eyes, nor hearing attuned to the Word of God: they only had authority". "When there is no prophecy in the people of God, the void it leaves is filled by clericalism: In fact it is this clericalism that demands of Jesus: ' By what authority do you do these things ? By what law? ' . And the memory of the promise and hope to move forward will be reduced only to the present: no past, no hopeful future. The present is legal: if it is legal you go forward". But when legalism reigns, the Word of God is absent and the people of God who believe, cry in their heart, because the Lord is absent: they need prophecy. They cry, "how mother Anna, the mother of Samuel, cried begging for the fertility of the people, the fruitfulness that comes from the power of God , when He awakens in us the memory of his promise and pushes us towards the future with hope. This is the prophet, This is the man with the penetrating eyes and who hears the words of God". "Our prayer in these days as we prepare for the birth of the Lord, is: 'Lord, may we never lack prophets in your people .' All of us who are baptized are prophets. 'Lord, may we never forget your promise! May we never tire of going forward! May we never close ourselves within the legalism that closes doors! Lord, save your people from the spirit of clericalism and help us with the spirit of prophecy'". 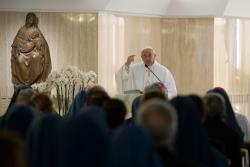 Pope warns against everyday temptation to "flee from God "